SCI Education Sables Mission Statement: To further the understanding of our outdoor heritage, including the positive role of hunting, through the creation and support of wildlife and conservation educational programs that are consistent with the educational mission and purposes of SCI and SCI Foundation. The ACSCI Sables committee are women and men who hunt and some who don't but support the mission and programs of SCI. Membership is not limited. Many participants have a membership in both SCI and the Sables Committee, and some are only Sables members. SCI and SCI Foundation's financial investment of the American Wilderness Leadership School (AWLS) is making a difference in what educators are presenting to the youth they teach. Surveys of AWLS alumni are showing over 87% are teaching conservation to their students and that 66% of alumni are participating in shooting sports. Those AWLS educator alumni will reach more youth who will learn about conservation and the positive role of hunting. 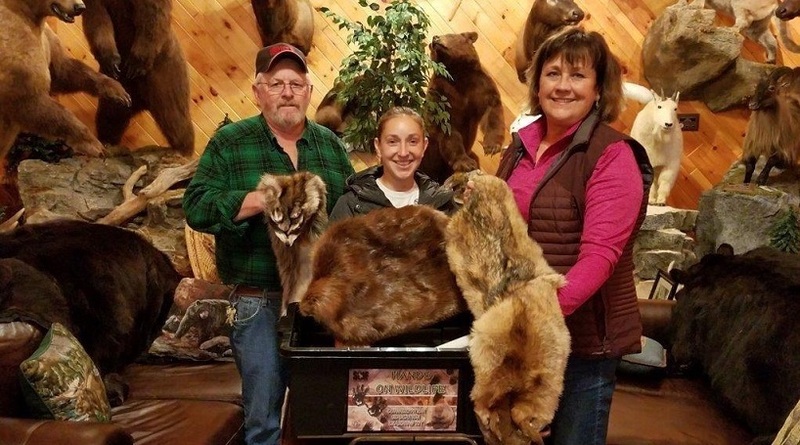 Larry Steiner, Adirondack-Catskill (A-C) Chapter President and Robin Jerauld A-C Sables Representative proudly present Mary Havlik with her own 'Hands On Wildlife' (HOW) education box purchased by the Adirondack Catskill Sables Committee. This final step solidifies the investment a chapter, Sables Committee or individual makes in sending an education professional to the American Wilderness Leadership School (AWLS). The HOW Box arms the educator with the appropriate tools to maximize their impact of conservation education with their students. Congratulations Mary! We look forward to hearing about your future success! Chapter sponsorship of youth and educators attending AWLS programs.